WHAT IS COMFORT CARE ANESTHESIA? I am very excited to talk about some new technology we have in our practice to reduce pain and anxiety for our patients right here in Waxhaw, NC. Our Comfort Care Anesthesia package consists of the STA Single Tooth Anesthesia Device and The Wand by Milestone Scientific. It also includes a prescription strength topical anesthetic compounded for us right here in South Charlotte, NC. 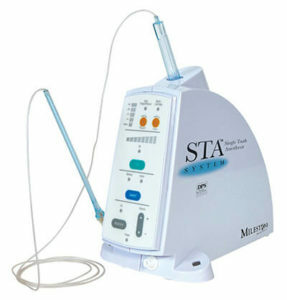 The STA is a computer controlled local anesthetic device. It has pressure sensitive feedback and control to decrease pain and anxiety many associate with a traditional dental injection. The Wand is the delivery hand piece. It is a light weight, pen-like delivery system that provides comfortable dental injections. Finally, we use a prescription topical gel anesthetic that is a strong mixture we have made right here in South Charlotte, NC. A two minute application provides profound numbing of the gums for an easy start. We package all this together and call it our Comfort Care Anesthesia package. It can also be used in addition to our Nitrous Oxide Sedation. The bottom line is this. I’ve been practicing over ten years and am very confident and happy to offer this great service to the many of patients that have fear or anxiety of a dental injection. The results have been wonderful! If you have any questions or would like to reserve an appointment at our Waxhaw, NC office please call 704-373-6040 or email team@newtowndds.com.